Set in East Texas and moving to Northern Mexico, The Gauntlet sees the player-charcters in the ruined world twenty years after a nuclear war has destroyed most of civilization. They begin as captive serfs in a neo-feudal society and must escape from this state of near-slavery and then find purpose for their lives. Offered the opportunity to bring needed tyechnology to one of the few remaining areas attempting to restore a technological society in Matamorors, Mexico, the characters may choose to attempt to carry the vital communications technology through hostile societies and past raiding groups along the Gulf Coast of Texas and into Northern Mexico. Hostile humans, dangerous beasts, mutated creatures, radioactive wastes, disease, and even the scarcity of the basic necessities like food and clean water make for a challenging quest. Will the player-characters be able to succeed in the face of the dangers and shortages they will encounter? 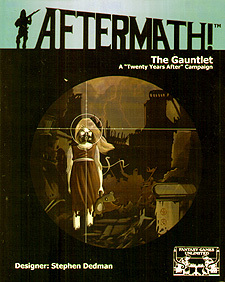 An exciting campaign for the Aftermath! game system.